To sniff that smelly spot. Get to the park or car faster. To be greeted by a person/dog. These are all reinforcing the dogs choice to pull. This is especially true if a behavior is rewarded occasionally such as; When the kids walk the dog, pulling is allowed, when mom and dad so, no pulling. When I am training, no pulling, when I am on the phone on a walk, pulling is okay. Dogs are always hopeful that “this time it will work” and so they go back to trying behaviors that were successful in the past, no matter what. So how do we fix it? First we set them up to succeed by practicing being calm when the leash comes out in the house. Often we allow dogs to go “banana cakes” when we take out the leash and then wonder why they are so excited when we walk outside. Second we practicing walking on leash without pulling in non distracting location like our living room, deck or backyard. The dog begins to learn to keep his brain about him and focus on the new way to get what he wants. Dog learns: If I stay connected to mom and be near her leg then I get rewarded with some food and then we walk more. If I pull we dont go anywhere and no food appears. When they do pull we have a few ways to teach them to make another choice. Remember we are starting in the house with little to no distractions so your dog can learn, we can add distractions later. Stop moving all together and wait for them to back up, look at you etc. Starting with the littlest behavior they can offer. Then click/reward with a piece of kibble or a tiny treat by your left leg. Continue until they stop pulling and then take a step forward. If your dog pulls, immediately turn and go the other way a few steps, then turn, stop and wait. 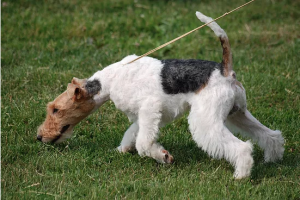 If your dog stays with you take a step in the direction you were going originally, click and reward with a piece of kibble or a tiny treat by your left leg. If they stay with you, continue forward one step at a time, if they don’t, turn again and go further away this time. This is just an overview of the process and each dog has their own personality so sometimes we have to adjust based out our dog. I have a great FREE handout for loose leash walking/not pulling. If you would like a copy please just email me and I will send it right along. We also offer a “Walk with Me” one day workshop that will get you back on the path to a nice leisurely walk you can both enjoy.